If missing teeth are left untreated, it can lead to adverse effects on your oral health. 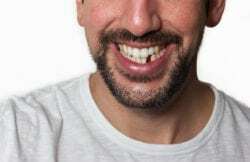 Missing teeth can be the result of dental trauma or a complex dental concern. Dr. Jospeh Cavallo offers a full range of tooth replacement options in our Woodbridge, VA dental office. Dr. Cavallo is a highly skilled restorative dentist in Woodbridge, VA.
Dr. Cavallo often recommends dental implants for patients missing one or more teeth. Dental implants have the highest success rate among other tooth replacement options. Dental implants are durable and resemble the natural smile. During your consultation, Dr. Cavallo can work with you to determine if dental implants are right for you. Dr. Cavallo has had many years of experience restoring missing teeth. Dr. Cavallo offers a full range of tooth replacement services, including dental implants, dentures, and dental bridges. Woodbridge dentist Dr. Cavallo perform all aspects of the dental implant procedure in our dental facility. We will work with you to determine which tooth replacement option is right for you. Dental Implants: Dental implants can replace one or more teeth. Dental implants mimic the tooth root to create a long-lasting, durable foundation for your final restoration options. Dental implants can be used to secure dental crowns, dentures, or dental bridges. Dentures: Dentures can be used to replace the top, bottom, or both arches of missing teeth. Dentures are typically removable but can be fixed into place using a few strategically placed dental implants. Dental Bridge: Dental bridges can be used to replace consecutive missing teeth. Dental bridges are usually supported by the adjacent teeth. For a more stable solution. A dental bridge can be secured using dental implants. Replacing missing teeth is essential to restore your oral health. if left untreated, missing teeth can lead to bone deterioration, infection, and further tooth loss. To learn more about tooth replacement, visit our Woodbridge, VA dental office. To schedule a consultation, call 703.493.1203 or schedule a consultation online.